In the book Rediscover Catholicism, Kelly devotes a chapter to the Mass. He describes the reasons many Catholics give for no longer attending Mass and offers some proactive suggestions for reengaging the disengaged. One suggestion Kelly offers is to take a small notebook (Mass Journal) to Mass. While participating in the service, ask God to share one way I can become "a - better - version - of - myself this week". Then listen during the music, readings, homily and prayers for the one thing that stands out. Record this and spend the rest of the Mass praying how you can become "a - better- version - of - yourself" during the coming week. I decided to get a small notebook a month ago and began to record one word that resonated with me during Mass. One of the first words I recorded was "hope" and it became the title of my first post on this blog. The word I recorded last weekend was "renewal" and has since become the title for this my second post. Based on the gospel of the week, The Baptism of the Lord ( Luke 3:15-16, 21-22 ), our Parish priest Fr Wayne Healey invited all of us to renew our baptismal promises. 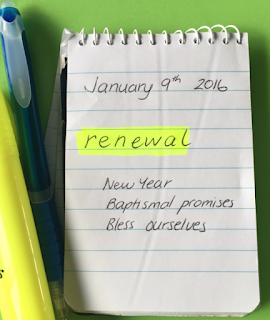 As he mentioned in the homily, this is the start of a new year and the perfect time for renewal. We were all invited to go forward and bless ourselves with holy water to remind us of when we were brought into God's family through the sacrament of baptism. Fr Wayne describes baptism as a precious gift. Sometimes, as baptised Catholics, we put this gift to one side while we focus on other things in our lives. Yet, the gift is always with us and it is never too late to unwrap and embrace it. God is patient and is always waiting to welcome us back to Mass and to a relationship with him through the guidance of the Holy Spirit. Come Holy Spirit, fill the hearts of your faithful. Enkindle in us the fire of your love. Send forth your spirit and you shall renew the face of the earth.